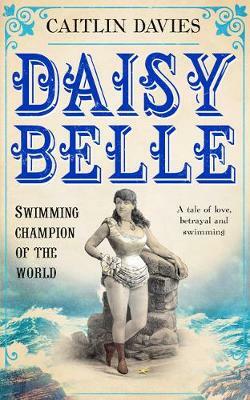 Summer 1867: four-year-old Daisy Belle is about to make her debut at the Lambeth Baths in London. Her father, swimming professor Jeffery Belle, is introducing his Family of Frogs - and Daisy is the star attraction. By the end of that day, she has only one ambition in life: she will be the greatest female swimmer in the world. She will race down the Thames, float in a whale tank, and challenge a man to a 70-foot high dive. And then she will set sail for America to swim across New York Harbour. But Victorian women weren't supposed to swim, and Daisy Belle will have to fight every stroke of the way if she wants her dreams to come true. Inspired by the careers of Victorian champions Agnes Beckwith and Annie Luker, Daisy Belle is a story of courage and survival and a tribute to the swimmers of yesteryear. Caitlin Davies is a novelist, non-fiction writer, journalist and teacher - and likes nothing better than outdoor swimming. Many of her books are inspired by the stories of forgotten women from the past, and several have a watery theme. Her ground-breaking history of Thames swimming, Downstream, was described by the Independent as `a fascinating cultural history of swimming', and resulted in the Museum of London's first ever Wild Swimming Display. Caitlin was born in London in 1964, and after training as an English teacher she moved to Botswana where she became a journalist for the country's first tabloid newspaper, the Voice. While working as editor of the Okavango Observer she was arrested for `causing fear and alarm', and also received a Journalist of the Year award. Four of her books are set in the Okavango Delta, where she lived for 12 years, including the critically acclaimed memoir Place of Reeds. Caitlin is currently a Royal Literary Fund Fellow at the University of Westminster, Harrow, in the School of Media, Arts & Design.